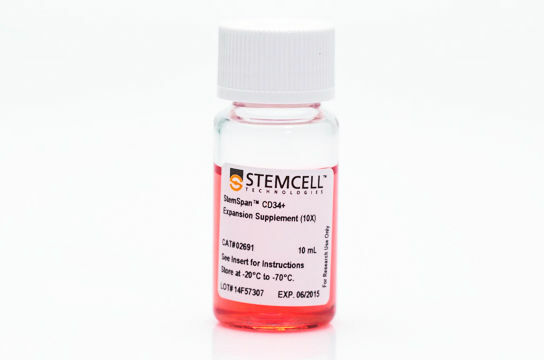 StemSpan™ serum-free hematopoietic cell expansion media promote the expansion and/or lineage-specific differentiation of human hematopoietic stem and progenitor cells (HSPCs) when supplemented with hematopoietic growth factors and/or other stimuli selected by the user. 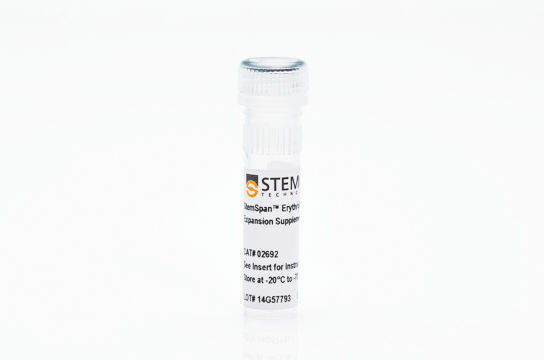 StemSpan™ Expansion Supplements are pre-mixed cocktails of recombinant human cytokines and other additives formulated to selectively promote the expansion of CD34+ stem and progenitor cells, or to stimulate their differentiation into erythroid, myeloid (granulocyte or monocyte) or megakaryocyte progenitor cells, when added to StemSpan™ media. Complete kits for the expansion and lineage-specific differentiation of CD34+ cells into T or NK cells in stroma-free conditions are also available for research into lymphopoiesis. 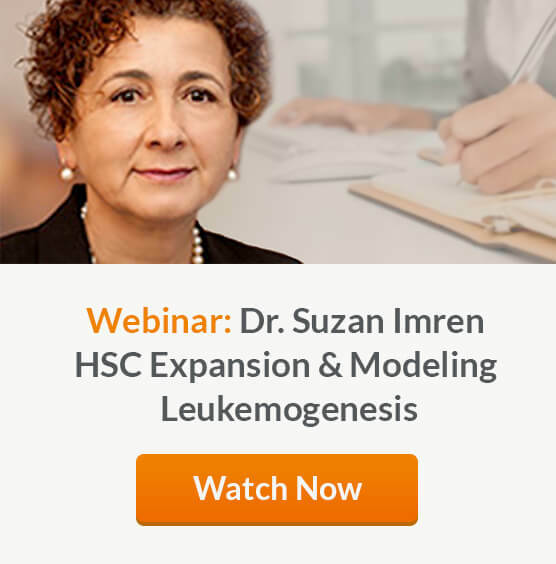 Why Use StemSpan™ Media and Expansion Supplements? REPRODUCIBLE. Components are carefully selected to minimize lot-to-lot variability and support optimal and consistent culture results. CONVENIENT. Media do not contain cytokines, allowing the flexibility to add StemSpan™ Expansion Supplements, cytokines and/or additives. SUPERIOR PERFORMANCE. 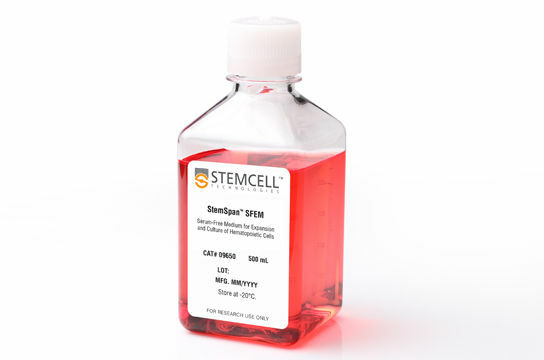 StemSpan™ SFEM II, combined with the appropriate Expansion Supplement, supports greater expansion of CD34+ cells and differentiation of erythroid cells, granulocytes, monocytes, megakaryocytes, T and NK cells than other media tested. SERUM-FREE AND DEFINED. StemSpan™-ACF is the first commercially available animal component-free medium for culturing HSPCs. 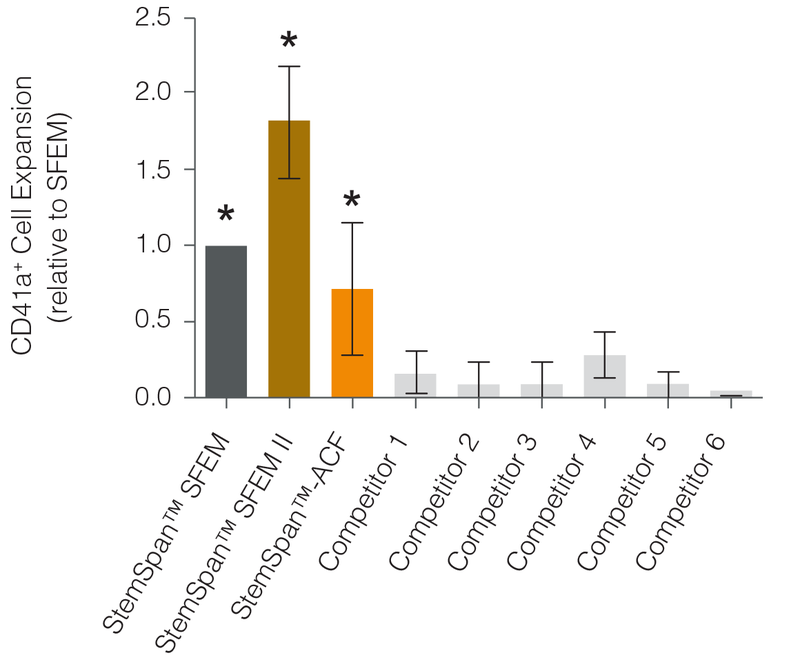 Expansion of CD34+ cells normalized relative to the values obtained in StemSpan™ SFEM medium (dark gray bar) after culturing purified CD34+ CB cells for 7 days in StemSpan™ SFEM, SFEM II (gold bar) and ACF (orange bar), and six media from other commercial suppliers (light gray bars; Competitor 1-6, which included, in random order, StemLine II (Sigma), HPGM (Lonza), HP01 (Macopharma), SCGM (Cellgenix), StemPro34 (Life Technologies) and X-Vivo-15 (Lonza)). All media were supplemented with StemSpan™ CC100 Cytokine Cocktail. Vertical lines indicate 95% confidence limits, the range within which 95% of results fall. 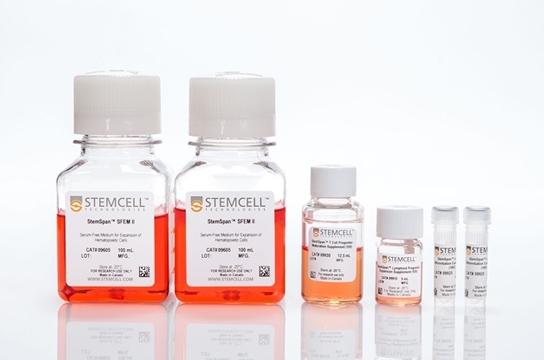 The numbers of cells produced in StemSpan™ SFEM II were significantly higher than in all other media, except the numbers of CB cells produced in StemSpan™-ACF (*p<0.05, paired t-test, n=6). 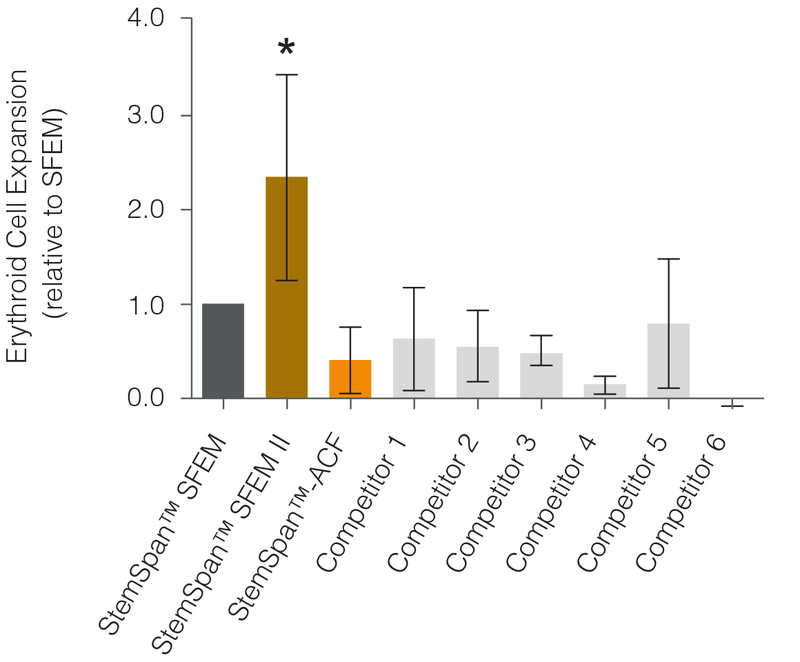 Expansion of CD34+ cells normalized relative to the values obtained in SFEM medium (dark gray bar) after culturing purified CD34+ CB cells for 7 days in StemSpan™ SFEM, SFEM II (gold bar) and ACF (orange bar), and six media from other suppliers (light gray bars; Competitor 1-6, which included, in random order, StemLine II (Sigma), HPGM (Lonza), HP01 (Macopharma), SCGM (Cellgenix), StemPro34 (Life Technologies) and X-Vivo-15 (Lonza)). All media were supplemented with the StemSpan™ CD34+ Expansion Supplement. Vertical lines indicate 95% confidence limits, the range within which 95% of results fall. 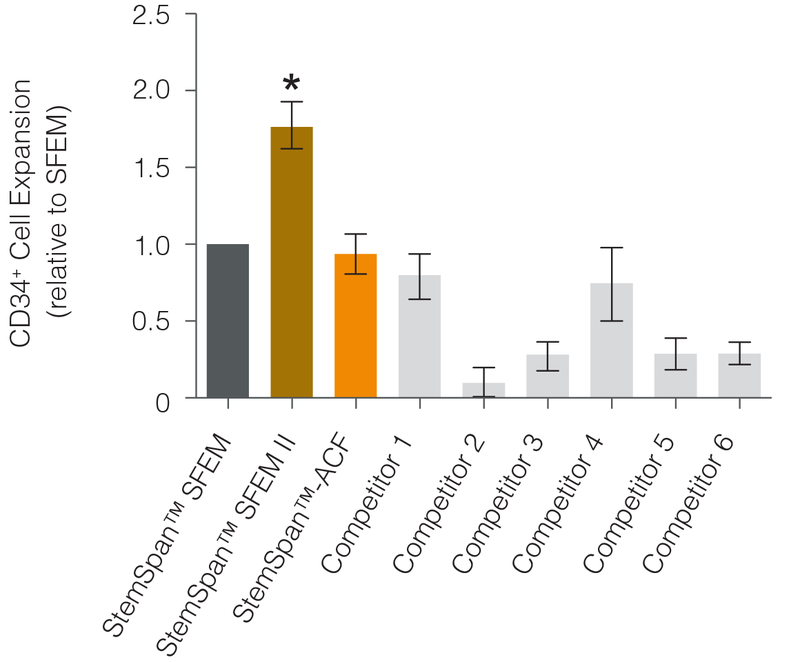 The numbers of cells produced in StemSpan™ SFEM II were significantly higher than in all other media (*p<0.01, paired t-test, n=6). The numbers of erythroid cells, normalized relative to the values obtained in StemSpan™ SFEM medium (dark gray bar), obtained after culturing purified CD34+ CB cells for 14 days in StemSpan™ SFEM, SFEM II (gold bar) and ACF (orange bar), and six media from other commercial suppliers (light gray bars; Competitor 1-6, which included, in random order, StemLine II (Sigma), HPGM (Lonza), HP01 (Macopharma), SCGM (Cellgenix), StemPro34 (Life Technologies) and X-Vivo-15 (Lonza)). All media were supplemented with StemSpan™ Erythroid Expansion Supplement. Vertical lines indicate 95% confidence limits, the range within which 95% of results fall. 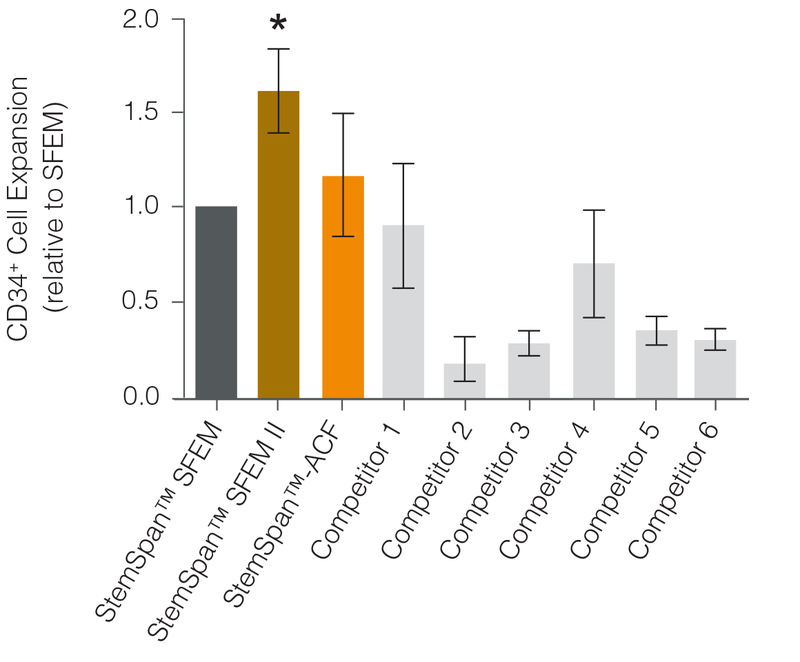 The numbers of cells produced in StemSpan™ SFEM II were significantly higher than in all other media (*p<0.05, paired t-test, n=6). The numbers of megakaryocytes, normalized relative to the values obtained in StemSpan™ SFEM medium (dark gray bar), obtained after culturing purified CD34+ CB cells for 14 days in StemSpan™ SFEM, SFEM II (gold bar) and ACF (orange bar), and six media from other commercial suppliers (light gray bars; Competitor 1-6, which included, in random order, StemLine II (Sigma), HPGM (Lonza), HP01 (Macopharma), SCGM (Cellgenix), StemPro34 (Life Technologies) and X-Vivo-15 (Lonza)). All media were supplemented with StemSpan™ Megakaryocyte Expansion Supplement (Catalog #02696). Vertical lines indicate 95% confidence limits, the range within which 95% of results fall. The numbers of cells produced in the StemSpan™ media were significantly higher than in the other media (*p<0.01 paired t-test, n=6). Shown are numbers of total nucleated cells (TNCs) produced per input human CB-derived CD34+ cell and percentages of cells positive for myeloid markers CD13, CD14 and CD15 after 14 days of culture in SFEM II containing Myeloid Expansion Supplement (n = 14) or Myeloid Expansion Supplement II (n = 16). *95% confidence limits (CL); the range within which 95% of results typically fall. CB-derived CD34+ cells (freshly isolated or frozen) were cultured with the StemSpan™ T Cell Generation Kit (Catalog #09940) for 42 days and (A) analysed by flow cytometry for the expression of CD4, CD8, CD3 and TCRαβ. The (B) frequency and (C) yield of CD4 ISP, double-positive (CD4+CD8+) and CD3+TCRαβ+-expressing double-positive cells (CD4+CD8+CD3+TCRαβ+) are shown. On average, 38% of the total viable population were DP (CD4++), of which 35% co-expressed CD3 and TCRαβ. The yields of total DP cells and CD3+TCRαβ+ DP cells per input CD34+ cell were ~23,000 and ~9,000, respectively. Shown are means with 95% confidence intervals (n = 31). DP cells were further matured into CD8 SP T cells by culturing for an additional 7 days in StemSpan™ SFEM II with T Cell Progenitor Maturation Supplement (Catalog #09930), IL-15 (Catalog #78031) and ImmunoCult™ CD3/CD28/CD2 T Cell Activator (Catalog #10970) on coated plates. On day 49, cells were (A) analyzed by flow cytometry for the expression of CD3, TCRαβ, CD4 and CD8. The (B) frequency and yield of CD3+TCRαβ+-expressing cells and their subsets are shown. On average, 54% of the CD3+TCRαβ+ cells were DP (CD4+CD8+) and 38% were CD8 SP (CD4-CD8+). The average yield of CD8 SP T cells per input CD34+ cell was ~6,000. CD3+TCRαβ+ CD4 SP (CD4+CD8-) T cells were detected at very low frequencies (data not shown). Shown are means with 95% confidence intervals (n = 12). CB-derived CD34+ cells (freshly isolated or frozen) were cultured with the StemSpan™ NK Cell Generation Kit for 28 days. Cells were harvested and analyzed for (A, B) CD56 and (A) NKp46 expression by flow cytometry. Dead cells were excluded by light scatter profile and viability staining. (B) The average frequency of viable CD56+ NK cells on day 28 was 77%, with ~9,000 CD56+ cells produced per input CB-derived CD34+ cell. Shown are means with 95% confidence intervals (n = 45: 23 freshly isolated and 22 frozen CD34+ cell samples). BM-derived CD34+ cells were also differentiated into NK cells using the StemSpan™ NK Cell Generation Kit. The yield of NK cells from BM HSPCs is typically lower than with CB, averaging ~75 per input CD34+ cell (n = 3, data not shown).